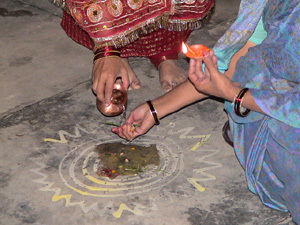 Karva Chauth fast is a very difficult task related to the 4th day of the descending Moon cycle in the auspicious month called Kartik (October/November). 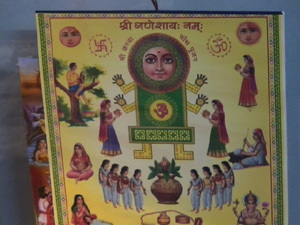 Kartik is the eighth month of the Hindu lunar calendar, and the fast has also a connection to the famous and beloved elephant headed God Ganesha . 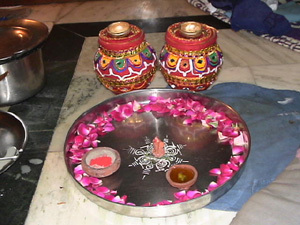 On this day married women decorate their hands and feet with beautiful henna patterns and take a vow (sankalp) or decision to remain without food, without water, and without sleep from the time of sunrise till the moon is rising, for their happy and prosperous married life and for the wellbeing of their husband. No doubt, this Karva Chauth fast is everything else than easy to observe, but it obviously strenghtens the willpower immensely and refreshes the energy of the women who engage in it from the very source of their heart. The fast also creates a firm bond of sisterhood and equanimity amongst the women who observe it together. Even nowadays, when the family lifestyle and the relationships between the modern men and women change drastically, the traditional loyalty of truthful Indian woman towards their husband has remained unshaken. In big towns, where joint families are nearly no more existing, married ladies arrange a coming together to enjoy this Karva Chauth day of sacrifice in a traditional and ritualistic celebration. The women are wearing their beautiful wedding Sari, apply vermillion colour in their hair, and decorate their forearms with beautiful new bangles to match the artistic henna patterns of their hands and feet. 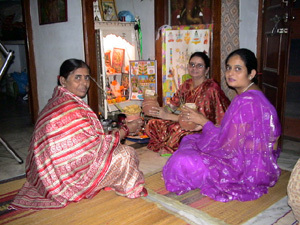 The women will sing together and recite several interesting stories related to this fast. In one of the stories, Savitri, the legendary fasting woman, confronts the Lord of Death, Yama, and due to the power of her honest and devoted fast she gained back her husbands life and much more. Legends strengthen the power of mind and memory, provide determination, and remind the fasting ladies, that a higher goal can be achieved through sacrifice. The Moon rises late in the lunar month of Kartik, but during their waterless Karva Chauth fast the ladies seem to grow and glow in patience. After the performance of elaborate rituals in front of the Moon they are rewarded by a special delicious meal which ends the fast when the "Chauth Maata", the mother goddess that rules over the auspicious month of Karitk, is pleased with her devotees. 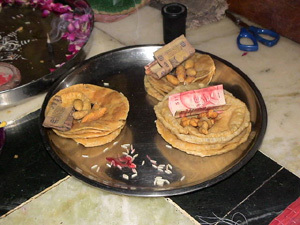 Offerings of eight puris and eleven Rupees are made to the Chauth Maata in front of the shrine. Text written by Heidi Rauhut.